​The name sounds safe enough, but if an airsoft gun is on your teen’s wish list, you should keep a close eye on safety. These non-powder guns look like real guns and are sold in sporting goods and other retail stores. Kids use them to shoot 6 millimeter plastic pellets at targets or each other. Their rising popularity has led to an increase in eye injuries. Those who do not wear eye protection are at risk of eye injury, according to the AAP. Airsoft pellets that strike the eye can cause scratches, painful pooling of blood inside the eye, lens dislocation or blindness. The AAP recommends that kids use paintball-style protective eyewear. Look for a label that says the glasses meet ASTM F1776 safety standards. 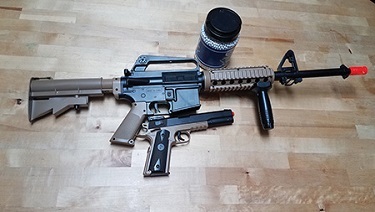 Airsoft guns are sold alongside other non-powder guns like BB guns that fire metal ball bearings, pellet guns that fire small lead pellets and paintball guns that fire gelatinous balls filled with paint. Air, other gases, springs and electricity help shoot the ammunition out of the gun. Non-powder guns have an orange tip so they are not mistaken for a real gun. The tip should not be removed. BB guns and metal pellet guns are not designed to be shot at people. They can kill small animals, though. “(They) are clearly better described as weapons,” Dr. Nelson said. Airsoft and paintball guns are designed to be shot at other people in games. They can cause welts on the skin but are not supposed to break the skin. “They sting. Use protective clothing if you don’t want to get stung,” said Dr. Nelson. For these reasons, the AAP does not suggest an age when airsoft guns are considered safe. Parents should consider whether their child understands the risks and will wear eye protection.